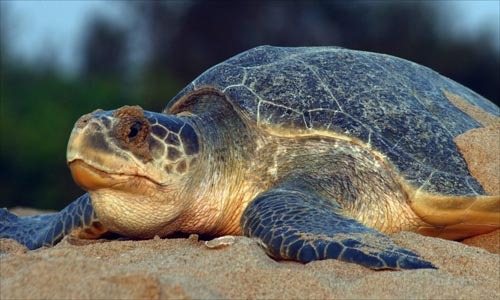 Kendrapara - Ahead of the mass nesting of Olive Ridley turtles, wildlife officials have detected sporadic nesting by them at Gahirmatha nesting ground in Odisha, the world's largest known rookery of these marine animals. During January-February each year, Olive Ridley turtles turn up in millions for laying eggs along the Gahirmatha beach in the district. "Small group of turtles have crawled their way to the nesting beach at Nasi-2 Island and have begun laying eggs. Sporadic nesting of turtles is a positive sign and is a prelude to en-masse emergence of turtles for laying eggs," said Divisional Forest Officer, Rajnagar Mangrove (wildlife) Forest Division, Kedar Kumar Swain. Cuttack : If inhabitants of England are English, Germany are Germans and USA are Americans then why all inhabitants of Hindustan are not known as Hindus, came a poser from RSS chief Mohan Bhagwat on Sunday. "The cultural identity of all Indians is Hindutva and the present inhabitants of the country are descendants of this great culture," Bhagwat said while speaking at the 'Golden Jubilee' function of an Odia weekly here. Sriharikota (Odisha)/New Delhi, June 29 - Prime Minister Narendra Modi is expected to witness the launch lift off of the Indian Space Research Organisation's (ISRO's) PSLV C23 on Monday morning. According to reports, the Polar Satellite Launch Vehicle (PSLV) will carry a French Earth observation satellite along with four other satellites from Singapore, Canada and Germany on June 30 from the Sriharikota spaceport in Andhra Pradesh. The countdown for the launch began on Saturday, and is progressing normally. Bhubaneswar, April 12 - India Friday successfully conducted the night trial of surface-to-surface Agni-I ballistic missile from a military base in Odisha, an official said. The missile was launched by the Strategic Forces Command as part of user trial from the Wheeler Island off the coast near Dhamra in Bhadrak district, 170 km from state capital Bhubaneswar. "The test was successful. This was a routine user trial and conducted at night" test range director M V K V Prasad told IANS. Bhubaneswar, April 10 - Polling began on a peaceful note for 10 Lok Sabha and 70 assembly seats in Odisha, an official said. People stood in queues outside polling centres before polling started at 7 am. "Everywhere balloting has started. We talked to all the district collectors and police officials and from nowhere have we got any complaints so far. It has started on a peaceful note," state's Chief Electoral Officer Mona Sharma told IANS. Over 13 million electors will cast their ballots in the first phase of polling. Bhubaneswar, April 5 : Congress president Sonia Gandhi Saturday spoke of land reforms and women's safety at a rally in Odisha's Khariar Nuapada district and attacked the BJP, saying it had made allegations without any proof. "The Congress has always fought for the 'aam aadmi', specially the Dalits, the poor, the adivasis and the backward classes," she said. Gandhi said the funds provided by the central government have not been adequately utilised by the ruling Biju Janata Dal in Odisha. She pledged to fight for the issues of the poor. Bhubaneswar, April 4 : BJP's prime ministerial candidate Narendra Modi Friday appealed to the people to throw out both the Congress-led central government and Chief Minister Naveen Patnaik-led Odisha government, calling them 'nikammi sarkars' (useless governments). Odisha has fallen into ruin and both the state and the central governments are responsible for it, Modi said while addressing an election rally at the district headquarters town of Bolangir, about 330 km from here. "Whenever there is a discussion on poverty in the country, the example of Odisha is given," he said. Bhubaneshwar, Oct. 12 : Cyclonic storm Phailin, which is touching wind speeds of 210 to 220 kilometer an hour, is expected to hit the coast of Odisha and Andhra Pradesh at around 6 pm on Saturday. High wind and heavy rain lashed the coastal belt of Odisha today disrupting normal life. Phailin, which has been put in the category of Very Severe Cyclonic Storm (VSCS), is expected to touch 230 kilometer per hour, when it hits the two states. Bhubaneswar, Sep 29 - Aluminium major Nalco has declined to supply a trial amount of alumina to Vedanta Aluminium, triggering a controversy here. The move was seen as Nalco's renewed relationship with its private sector rival. But it came as surprise, when Chairman and Managing Director Ansuman Das said his company would not sell alumina within India. Bhubaneswar, June 7 : Senior Odisha Congress leader Niranjan Patnaik Friday urged the central government to take immediate measures to delink sports from politics. In a letter to Union Minister of State for Sports minister Jitendra Singh, the former president of the state unit of the Congress said the government must not allow any sports body to become so powerful as to flout basic legal principles. Indian defense officials have successfully test-fired the indigenously developed Prithvi-II surface-to-surface missile that has a strike range of 350km. The missile, which is capable of carrying nuclear warheads, was launched from Chandipur in the eastern state of Orissa. The Prithvi-II missile was launched from a mobile launcher in salvo mode from launch complex-3 of Integrated Test Range this morning. National Aluminum Company Ltd. (Nalco) is now eager to obtain a temporary work permit (TWP) to extract the bauxite ore from its Panchpatmali mine in Odisha as its lease deed for the same expired on Saturday. Nalco is optimistic that it would get the TWP by the end of November. The miner said it had sufficient stock to run its Damanjodi, Koraput-based alumina refinery till November-end. Tata Steel has reportedly been slapped with a fine of around Rs 6,000 crore for its alleged involvement in illegal mining at its captive mines. Citing unnamed sources, emerging reports state that Deputy Director of Mines (DDM) of Joda mining circle has fined Tata Steel and some other iron ore producers on charges of "illegal and excess mining." But, the reported amount of fine imposed on the steel maker couldn't be verified so far. Honing its missile competence, India on Friday successfully test-fired nuclear-capable Dhanush - a naval version of Prithvi missile that has a strike range of 350 kilometers. The surface-to-surface Dahnush missile was test-fired from a naval ship off Odisha coast. Blasted off at 11.25 am, the missile traveled along the pre-coordinated trajectory, and splashed down in close proximity to the pre-designated target in the Bay of Bengal.